QuickBooks Online helps you to organise your accounting in one place and to see all of your financial transactions at a glance with easy setup, creation and editing of your chart of accounts. Access your chart of accounts, transaction details, financial reports and more anytime and from anywhere. The chart of accounts is a complete listing of each account in a business's accounting system. An account is a unique record that is used to organise the business's finances. Each financial transaction is assigned to a specific account, and the individual accounts together make up the the chart of accounts. The chart of accounts is used for recording transactions in the general ledger in order to provide a better understanding of the financial health of the business and to help the business comply with financial reporting standards. In other words, the chart of accounts is a listing of all the individual accounts in the geneal ledger that are used to organise your financial transactions. QuickBooks Online organises your accounting data in one place so that you can easily track everything coming into and going out of your business. With QuickBooks Online you can set up your chart of accounts in a few easy steps, ensuring that you are always recording and organising financial transactions accurately. 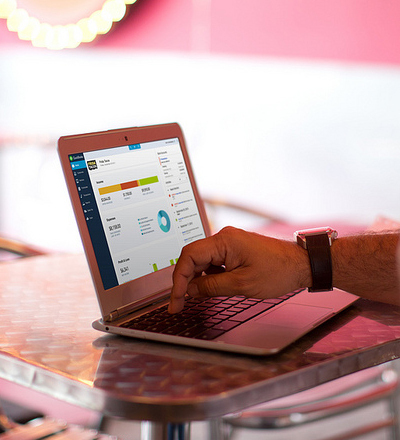 Try QuickBooks Online for free and see how easy it is to organise and categorise your accounting data. When you first set up QuickBooks Online, your answers to the startup interview questions will help QuickBooks choose a default chart of accounts for you, tailored closely to your business. You can edit, add or delete accounts and make sub-accounts in the default chart of accounts. You can access and edit your chart of accounts anytime and you can have as many accounts as you wish. Please note: if you prefer to record and track transactions from more than one bank account, you will need QuickBooks Online Essentials or QuickBooks Online Plus. The chart of accounts helps to organise each individual accounting transaction. Each time you record money coming into the business, your income, or money going out of the business, your expenses, you will associate the transaction with an account listed in your chart of accounts. QuickBooks makes this easy by including a drop-down list of your accounts form the chart of accounts on each transaction screen. © 2016 Intuit Limited. All rights reserved. Terms and conditions, features, support, pricing, and service options subject to change without notice.